Well-designed naming standards enable you to identify resources in the Azure portal, on an invoice, and within PowerShell scripts. Most likely, you already have naming standards for your on-premise infrastructure. When adding Azure to your environment, you should extend, and be consistent with those naming standards to your Azure resources. Naming standard facilitate more efficient management of the environment at all levels. Review and adopt where possible the Patterns and Practices guidance. As users in your organization add resources to the Azure subscription, it becomes increasingly important to associate resources with the appropriate department, owner, and environment. You can attach metadata to resources through tags. 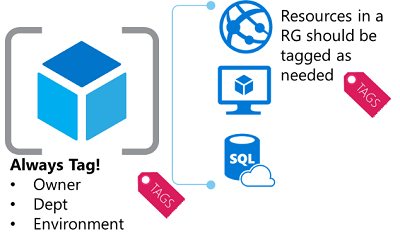 You use tags to provide information about the resource or the owner. 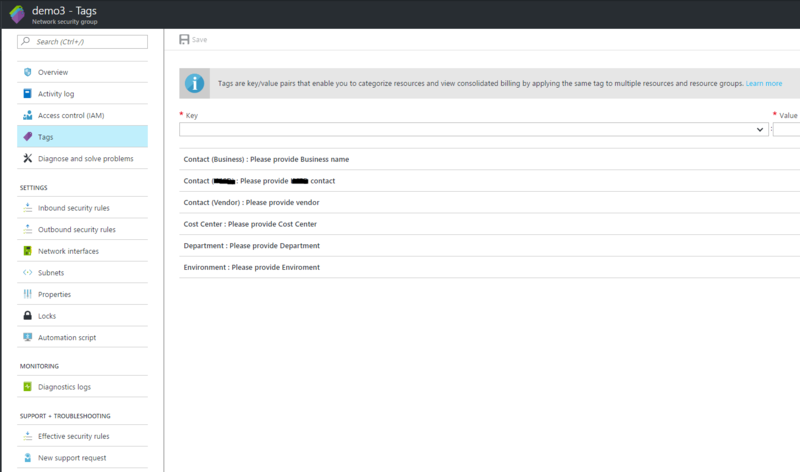 Tags enable you to not only aggregate and group resources in various ways, but also to use that data for the purposes of chargeback. You can tag resources with up to 15 key:value pairs. To address data sovereignty issues, my customer only wanted to allow Azure Resources to be deployed in 2 specific regions whereas Azure provides regions across the world. Enterprises often wish to control where resources are created (whether to ensure data sovereignty or just to ensure resources are created close to the end consumers of the resources). One way of applying these governance decisions is with Azure Resource Policies. Policy assignment – you apply the policy definition to a scope (subscription or resource group). This will be a Deployment PowerShell Script. As I need to create and assign more than one resource policy I’m going to script the Policy deployment and assignment. The script will have the policy JSON file as an input and deploy it to the Azure subscription. Append: Adds specified information to the resource. For example, if there is not a “CostCenter” tag on a resource, add that tag with a default value. Any new resources created within the specified subscription will have those tags that we defined in our JSON file appended to it. You then need to specify the subscription to assign the Policy definition. Policies are inherited by all child resources. So, if a policy is applied to a subscription, it is applicable to all the resource groups and resources in that subscription. View the code on Gist. Run the above script with the required parameters: That’s it! You have now created a new Azure Resource Policy definition and assigned that Policy to a subscription!